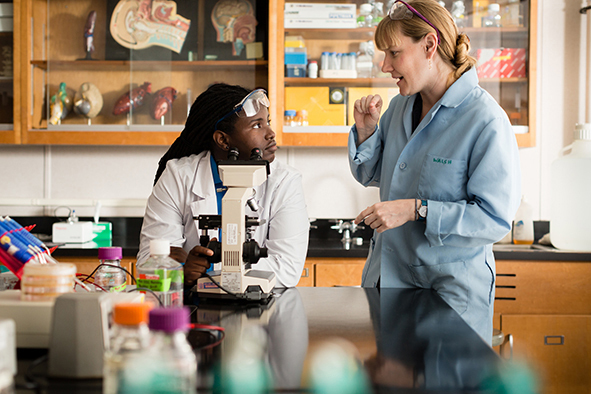 Learn more about the biochemistry/molecular biology degree program at Rollins College. The biochemistry/molecular biology major connects chemistry to biology in a way that opens a whole new world of possibilities—literally. At Rollins, it’s application over memorization. It’s mentoring over lecturing. It’s hands-on researching over data downloading. You will not get lost in a sea of classmates either, because at Rollins the doctorate-level professors in the biochemistry/molecular biology program know each student by name and by career goals. The mission is to inspire you to conduct novel research and choose a personal path, and then personally guide you there, whether it’s in health, pharmacy, post-grad work, business, or in a field we’ve barely discovered. Focused Attention The BMB major is small at Rollins, which means the faculty provides concentrated counseling throughout college and beyond. The program pairs nicely with highly marketable minors in global health or neuroscience. Grant Writing Skills You will apply biochemistry skills to the writing of grant proposals for real-world problems, like diseases that need more research. This is the essence of global citizenship and critical thinking. Research Access Undergraduates have opportunities to do their own novel research under the direct guidance of professors (no teaching assistants) and to potentially be published in peer-review journals. The approach of the lab-driven classes is to immerse you in each topic, so you can say, “Yes, I’ve done that.” Although this is not a “pre-med” major, those who choose to pursue med school will be fully prepared to take the MCAT. BCH 335 Biochemistry This is one of the “aha!” classes where you discover how chemistry connects to biology, perhaps in a lab experiment on avocados or on enzymes from your own saliva. BIO 341 Molecular Biology Explore how to repair DNA and how CRISPRs might be applied to the editing of human genes for the treatment of diseases. Small classes and minimal textbook work allow the faculty to keep classes like this on the leading edge of science. BIO 429 Immunology The immune system can be a complex topic. But by connecting biochemistry to the immune system, light bulbs go off and students become intrigued with research applied to real-life scenarios. BCH 435 Advanced Biochemistry No textbooks here! Studying cutting-edge research papers combines an understanding of why we believe something to be true with how we can advance with the latest technology. CHM 460 Advanced Topics in Chemistry You might make wine or sourdough bread to learn about fermentation. Or you might create something in the lab related to medicinal chemistry or nanotechnology. As the title suggests, the topics are fluid to stay relevant. BCH 498 Independent Study Research A professor mentors you through your own research project and an undergraduate thesis. Students have studied how a virus can cause cancer and how nanoparticles can be used for drug delivery. This is meaningful, legitimate science at the undergraduate level.